"826. Dock of Genesee Valley Stone Quarry"
Much of the old stone work along the old Genesee Valley Canal and in neighboring communities came from the "Blue Stone" stone quarries found south of Portageville along the Genesee River. 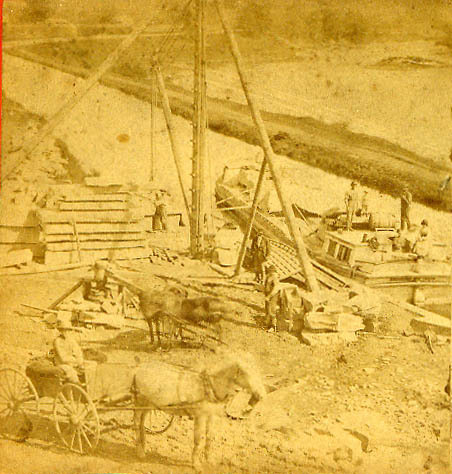 This image shows workers of the Genesee Valley Bluestone Company shaping and loading the cut stone on a canal boat on the Genesee Valley Canal. Beyond the Canal is the Genesee River. Bluestone was quarried as late as the 1960's in the Portageville area. Also see Image 138 for two additional views of the Stone Quarry. "Bluestone" by William L. Reddy, 150 Year Booklet of the Town of Genesee Falls, Portageville, New York, Fillmore NY: Big Tree Graphics, 1996.